In 1901, Victorian tea trader Frederick Horniman opened his museum (The Horniman Museum and Gardens, in London) with the ideal of bringing the world to Forest Hill. His collections were vast and varied, encompassing Anthropology, Natural History, and Musical Instruments. They have been added to extensively over the years. In 2012, the Horniman embarked on a three-year review of our Anthropology collections, Collections People Stories, with the aim of getting a clearer picture of what we now have and learning more about our objects, in order to inform a planned redisplay of some of our galleries. The review project was an enormous undertaking, involving staff from across the museum as well as external experts and community groups. 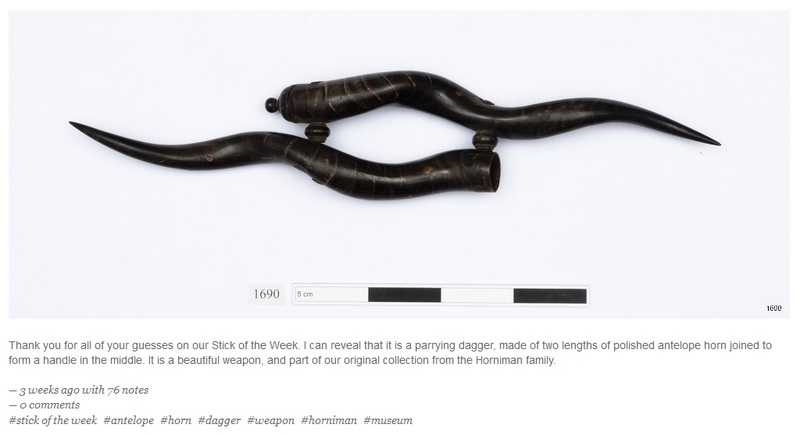 The progress of the project was shared on the museum’s blog, but we also wanted a more informal way to share the day-to-day work of our review team, and to highlight some of the amazing objects we saw every day as we ploughed systematically through the Study Collections Centre. 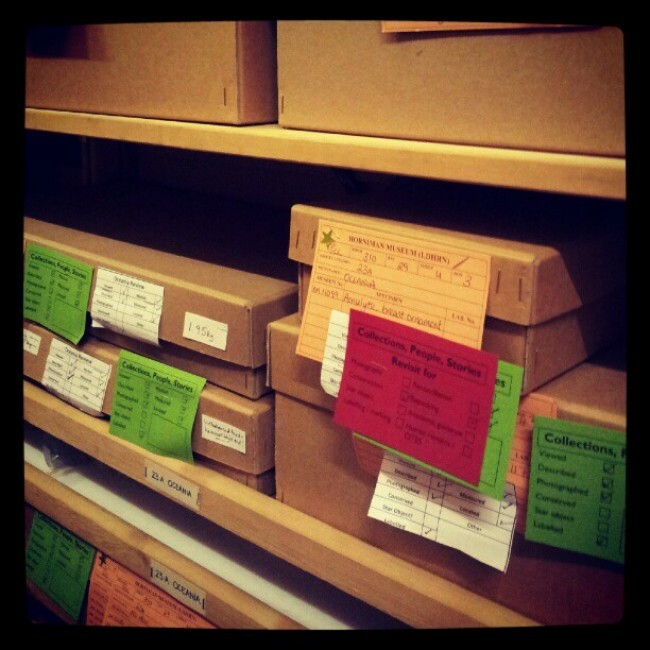 A review in action: lots of coloured labels! Tumblr fit the bill nicely: it is a microblogging (think very short-form) platform that can accommodate a variety of content, including text, pictures, video, and audio. We’ve found it works best with images, plus a small amount of text to explain what the object is and why it’s interesting. Posting is quick and simple, so it can fit into a busy workflow easily. Tumblr is also a great way of reaching a large audience with little initial effort, thanks to the snowball effect: followers can ‘reblog’ our posts, sharing them on their own page, and then other people reblog it on from there, and it can just keep going! Our page, In the Horniman, was set up in September 2012. The review team were given control of the page, and let loose! Our agenda with Tumblr is not overtly educational; we aim simply to share our enthusiasm for the collections with our followers. We choose objects just because we like them – anything that makes us say ‘Wow, that’s amazing!’ is an instant Tumblr candidate. We didn’t just want to share pretty pictures with our followers, though. We also wanted to encourage engagement. This is not as easy as it sounds, because of the way Tumblr works: followers can ‘like’ or ‘reblog’ posts with one click, but commenting is less common because it takes more effort. But without us even trying, it was happening: people were commenting on our posts, sometimes even telling us things we didn’t know about the objects. So we started an interactive feature called Stick of the Week, in which we share an image of a stick-like object and ask the good people of Tumblr to guess what it is. 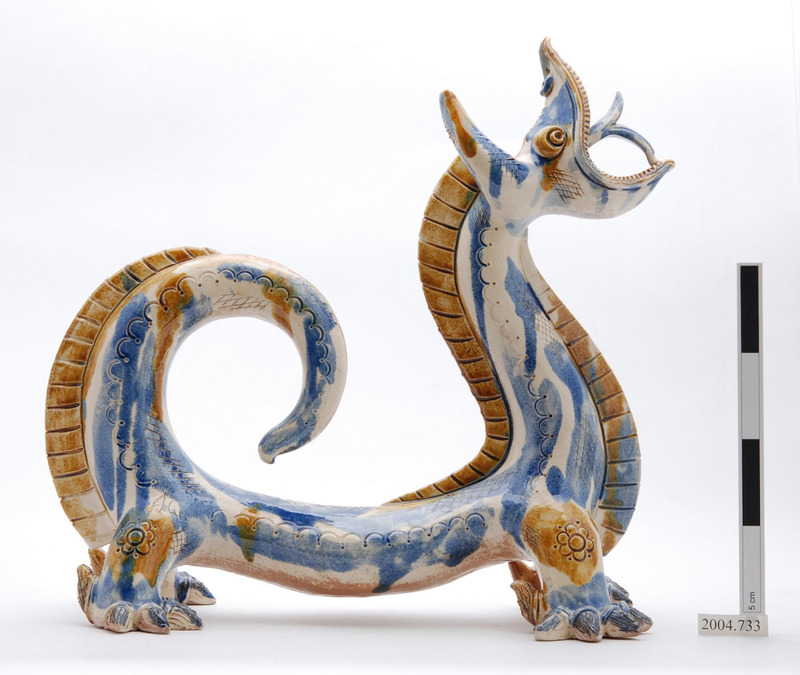 We have many such objects in the collection, and wanted to share them to highlight that any object can be interesting when you know its story! Stick of the Week sounds silly, but it has (hopefully!) got our followers looking at and thinking about objects differently, and allowed us to open up a dialogue. 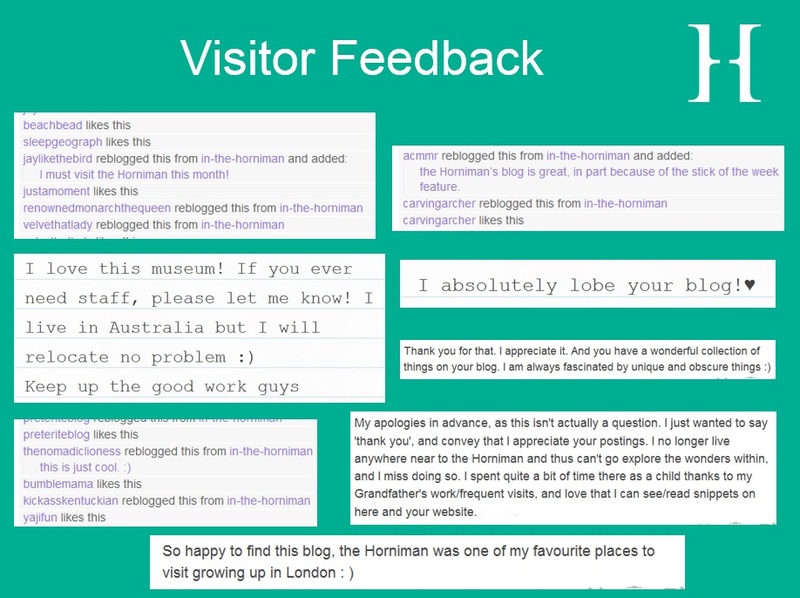 In The Horniman: people lobe it! Tumblr has given us a platform to share our collections with audiences all over the world, and a new way to engage people with our objects. Mr. Horniman’s aim in founding the museum was to bring the world to Forest Hill. Through Tumblr, we are now bringing Forest Hill to the world.